The Pelibüey is probably closely related to the West African, Red African, African or Africana breed of Columbia and Venezuela. It is descended from the West African Dwarf and is found in Cuba, coastal areas of Mexico and other locales in the Caribbean. Hair color ranges from beige, brown, dark brown, red, white, black and roan with both solid and a combination of colors found. Males do carry a throat ruff but usually do not have horns. Ewes are also usually polled. 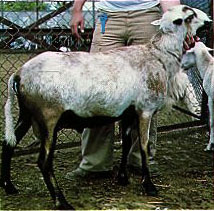 Mature rams and ewes weigh 54 and 34 kg, respectively. Litter size is relatively low at 1.24. 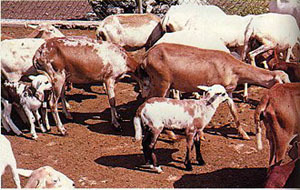 The ewes first lambing can be at 16 to 19 months of age. Lambing interval is less than 210 days. The lambs average at 12 kg at 120 days of age. Thomas, D.L., Hair Sheep Genetic Resource of the Americas. Proceedings Hair Sheep Research Symposium (ed. Stephan Wildeus). 1991. University of the Virgin Islands. Hair Sheep of Western Africa and the Americas: A Genetic Resource for the Tropics. (H.A. Fitzhugh and G.E. Bradford, eds. ), A Winrock International Study, 1983.